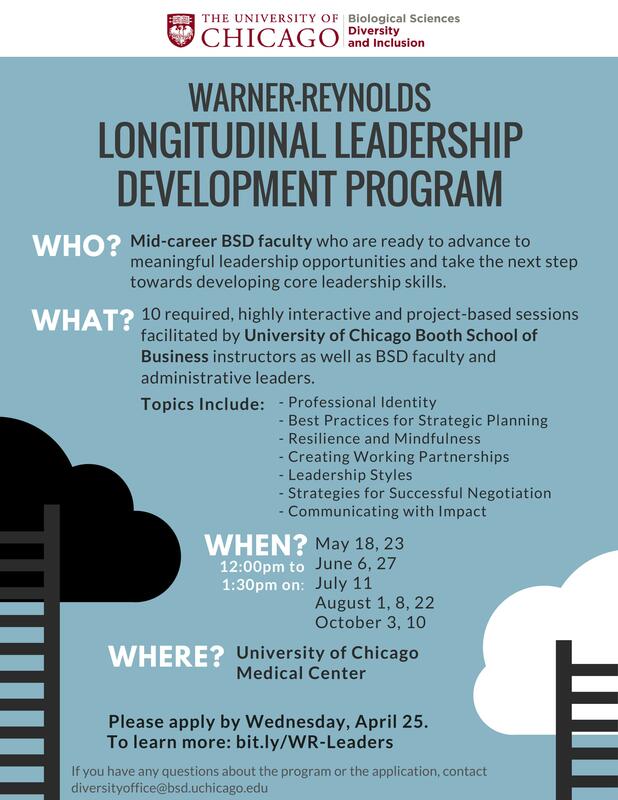 The Warner-Reynolds Longitudinal Leadership Development Program is a new opportunity sponsored by the BSD Office of Diversity & Inclusion, which focuses on mid-career faculty who are ready to advance to meaningful leadership opportunities and take the next step towards developing core leadership skills. Sessions are facilitated by both UChicago Booth School of Business instructors and BSD faculty and administrative leaders. At the beginning of program, participants complete a 360 leadership assessment. The 10 session series is highly interactive and project based. At the beginning of the program, participants choose a project that will further their aspirational goals as well as impact the institution. Please note, when you register you are asked to commit to attending all of the dates in the program. Participants cannot continue in the program if they have missed more than 2 sessions. In addition to the schedule above, a 45-minute individual session will be scheduled to review your 360 leadership assessment at a time that is convenient for you between May 18 – July 11. Participants will also have the opportunity to meet over lunch between formal sessions to provide support and resources for successfully completing their projects. Applications for the May 2018 cohort are now closed. If you have any questions about the program or the application, contact: diversityoffice@bsd.uchicago.edu.